Few fascist administrations have proceeded without direct participation of the reigning religious authority. In Mein Kampf, one can find the sentiment, quite early into it, that “In standing guard against the Jew I am defending the handiwork of the Lord”, and a phrase of related significance was emblazoned on the belt buckles of Hitler’s Wehrmacht: Gott mit uns, or, “God with us.” In return for the Fuhrer’s loyalty, the “Venerable” Pius XII managed to do as little as he could to help the wretched conditions and the systematic regime of murder taking place under his very holy jurisdiction. Even after the war, he still could not mention the killers by name, reciting a now-famous speech over the course of forty-five sanctimonious minutes exhorting “mankind” to protect the “hundreds of thousands” (oh, Pius!) from race-murder and oppression. His conduct during the Final Solution and his useless condemnation after the fact earn the pope rightful scorn at the Holocaust museum in Israel’s Yad Vashem, a slight that the current pope, himself a former member of the Hitler Youth, succeeded in protesting early last year, certainly earning his rodentine birth name Ratzinger. In Young Stalin, Simon Sebag-Montefiore’s redoubtable chronicle of poet and firebrand Joseph Djugashvili’s growth into the first Premier of the Union of Soviet Socialist Republics, the fledgling revolutionary renounces religion as early as he is able to tell the difference. He later succeeds in leading at first groups of other young men on minor waves of terror, ripping off banks in Tbilisi and committing acts of arson, but is finally able to consolidate his influence through a surgical itinerary of internecine purges. These were usually overseen or carried out by a psychotic henchman nicknamed Kamo, with the clear intention of galvanizing the lazy proletariat into participating in a revolution allegedly unfolding on their behalf. This incidentally sounds like the retrospective mandate for the classic black metal scene, with an emphasis on tearing down much the same forces (greedy corporations, corrupt religious institutions) and through much the same means. This is how the tired hashing out of the Euronymous/Grishnackh feud assumes a new element of absurdity, as what has been traditionally understood as an ideological clash – with Aarseth supposedly on the far left and Vikernes very clearly and unapologetically on the right – has more in common with the early Marxists than with their religious contemporaries in Italy, Japan, and the Third Reich. Vikernes has often admitted to being a religious man. It is only that his faith is largely unrecognizable to a majority of people and comes with the caveat that his gods have been recently played for camp on screen by the Hollywood actors Chris Hemsworth and Tom Hiddleston. In the documentary “Until the Light Takes Us”, he cutely posits that “everybody can relate” to the pagan gods; his writings on burzum.com intuit that the church fires he all but admitted to lighting were done to draw the line at the encroaching influence of Christianity. This is key to Stalinism, not Hitlerism, but Vikernes has embraced the latter (see his execrable anti-Jewish rant shortly after the terrorist attack of Anders Breivik in Oslo) even as he offensively pretends against his own neo-Naziism. Had Euronymous prevailed in 1993, the cult of personality would have centered around him, the busiest member of the “circle”, and it is not impossible to imagine black metal shifting leftward for the remainder of its golden years. The few stated leftists in black metal have taken for their genre the mouthy “red and anarchist black metal”, a reworking of the official name of an anti-racist, anti-fascist skinhead group from New York. (The illustrious Aaron Weaver of Wolves in the Throne Room definitely voted for Obama [no word on Nathan], and I don’t also doubt that the guys from Deafheaven or Liturgy did as well, but the kind of left-wing black metal I have in mind is more actionable.) 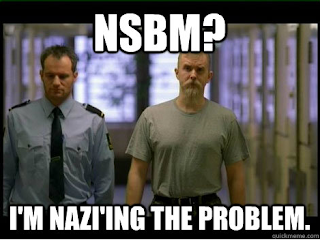 RABM does not like to think of itself as a reaction to NSBM any more than Vikernes likes to think of himself as BM at all, but it cannot be easy to dent the triumphant paradigm of nationalism in black metal when every genre release sounds like the first take on a rejected demo. The most well-known RABM band is Jarost Marksa (“Fury of Marx”), and their EP is unlistenable and largely derivative of the usual long-form tropes. The void left by Euronymous and awkwardly filled by the square peg of Vikernes-esque conservatism has, if I may be allowed to breathe new life in that old cliche, produced music first as tragedy, then as farce. For those on the left inclined to the chilly strains of a tremolo pick, the stunted growth of socialist black metal is an unforgiveable loss. It is a long-documented phenomenon that the most conservative states – those most opposed to institutional assistance – are ironically those most reliant on government intervention for their health and livelihood. And to ignite a church in service to another is not to tear down an institution, but to re-entrench oneself in it anew. RABM, if it ever gets off the ground, may be the last best opportunity of counterposing itself against the victorious trend. There was a familiar if faintly heard promise in the anti-church dictums of the original black metal scene, last perceived spoken into the yearning ears of Stalin’s and Mao’s proletariat – right before they were sent to the gulag. It is the same promise squandered in the vicious murders of Magne Andreassen and Sandro Beyer (the latter by a confessed neo-Nazi band). It would be nice to see that promise fulfilled in the reddened blush of a new age of black metal.